Our top 7 studios in Denver. 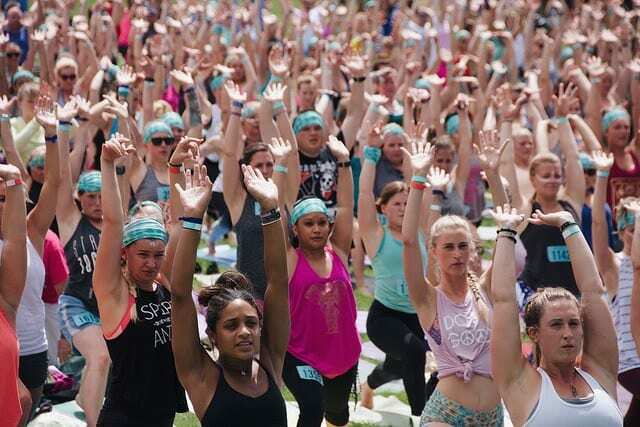 Check them out, and then take your practice further at the Wanderlust 108 Denver this season! The struggle is real when it comes to high altitude activity, but the yogis in Denver have acclimated to that high feeling (in more ways than one) and there isn’t a mountain high enough to keep practitioners away from the mat. We’ve put together a list of our favorite studios in the Mile-High City, so you can warm up for Wanderlust 108 on July 14—and keep the momentum going all year long. Full disclosure: studios marked with an asterisk (*) are Wanderlust studio partners; they certainly hold a special place in our practice. Tickets for Wanderlust 108 are still available! To buy and for more information about your best day ever, click here. We have several types of tickets available this year—and ALL yoga + meditation only tickets are FREE for the Denver event! A free ticket guarantees entry to the yoga and meditation portions of the event, as well as the Kula Marketplace. Entry to other bonus activities and the 5K are included with either the 108 Ticket, the 108 Ticket Package, or the premium WAN(DER)LUST Package. Have a studio you’d like to see on the list? Reach out to us on the Denver 108 Facebook event page and let us know. See you on the mat. The mission of Unlimited Yoga is to increase awareness of and access to wellness programs and classes in Colorado. We too believe that access to wellness is a right, and we’re proud to partner with organizations that work in that vein. Unlimited Yoga offers donation-based classes in both Denver and Boulder, Spanish-language classes, and adaptive yoga to truly provide yoga for every body. We love how much space there is at Yoga Pod LoDo—while some studios can feel cramped (cozy yoga is still great yoga, but sometimes you just want to take up all the space!) Yoga Pod LoDo has plenty of room for you to stretch and expand in more ways than one. Their offerings are varied, meaning there’s something for everyone—including Forrest-inspired classes—and their locker rooms are stocked with extra amenities that keep our bod feeling as fresh as our spirit after class. There’s more to yoga than asana, and the folks at Holistic Yoga School & Studio have that on lock. Their immersions and teacher training programs offer robust and complete overviews of yogic theory that transcend the basics and give students a varied and holistic look at practice. They encourage seva, community action, and sustainable living, and their teaching weaves in modalities from Earth medicine to artistic expression, herbalism, and Ayurveda. The River specializes in classes that are bent toward fitness, with a special offering that combines techniques of yoga and Crossfit, called Yoga Cross. It’s a great place to try new types of flow and find what’s best for you and your body—if you never try, you’ll never know. We love that The River manages to explore this modern approach to yoga while still holding true to the spirit of tradition—the vibe in the studio is far more meditation than iron-pumping. Who says you can’t spiritually sweat? If you’ve never been to a barre3 studio, drop what you’re doing and sign up for a class. The practice of barre has exploded in recent years, as people look to combine high intensity fitness with more mindful roots, and we can’t get enough. barre3 is a national chain that’s the creme-de-la-creme of barre classes. Check out the Denver location to get your fix. Another studio with a focus on inclusivity and yoga for all, we love getting our yoga high at, well, Yoga High. With massage and Reiki offerings alongside a robust and varied class schedule, we appreciate Yoga High for being able to calm us down after ramping it up. It’s a smaller studio, so classes are intimate and hands-on, and its location right in the heart of downtown Denver make it a great place to hop in and squeeze in a class even during a busy day. Denver is one of the sunniest cities in the country (did you know that Denver sees 300 days of sun every year?!) and True Yoga takes advantage of these abundant rays with a full wall of windows so you can truly salute the sun. They offer hot yoga classes so if you’re really looking to sweat, this could be your jam. (Don’t worry, they have great locker rooms and showers as well so you can cool down afterward.) With prenatal and restorative offerings as well, True Yoga truly has something for everyone. Join us at Wanderlust 108 Denver! Salute the sun in Denver with us!